A Bath company is working with a group of students from the Massachusetts Institute of Technology have a winning edge to their creation. Custom Composite Technologies is helping the MIT students to produce the mold for an electric car. Members of the solar-vehicle team visited the shop on Friday afternoon. Students and members of the businesses talked about the beneficial relationship. “We’ve worked with the previous MIT teams building their molds and offering them the shop for them to come up and lay out their cars,” said Steve Hassett, owner of Custom Composite Technologies. “We’ve had great experiences in the past on a previous car, and Steve’s allowing us to use his facility and he offers us a ton of experience and knowledge,” MIT student Trang Dang said. 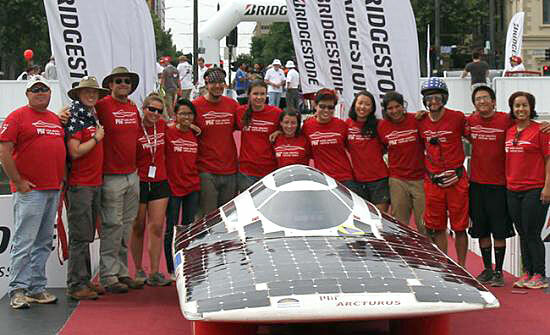 The car the group is building will be used in the 2015 Bridgestone World Solar Challenge in October in Australia.